As colleges, we need to incorporate standard academic practices to achieve scholastic goals, but is that enough? A slavish imitation of standard academic models leaves Jesus out of the classroom. Even classes on spiritual topics can be taught as an academic subject more than an opportunity to help students become authentically Christian in their own spiritual growth, their worldview, and their leadership skills. 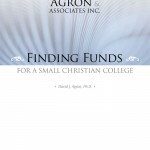 and understand how to work with special funding sources unique to Christian colleges (e.g., cultivating churches, working with boards). 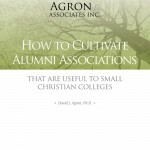 Some schools have alumni associations that merely provide social opportunities for alumni. Some schools have alumni associations that hardly function in any capacity at all. Schools that are new or developing may not have yet organized an alumni association. This Adobe Acrobat (.pdf) manuscript guides administrators as to how they can work with volunteer alumni leaders to develop an alumni association that will benefit both the school and the alumni. Training a staff member to work with the volunteers is key. 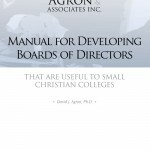 Does your board help raise money, donate significantly from their own funds, volunteer for useful projects… or interfere with administrative duties, not show up for meetings, not have a variety of professional expertise, not know standards of good practice for boards or otherwise not meet the standards expected of a college or graduate school board? It is not uncommon for emerging schools to have boards that do not understand their role in building a strong institution. This workbook is a training tool that the board works through. Because it has decision boxes, the board chooses from among appropriate options and personalizes the book into their own board handbook. The 100-page MS Word document (.doc) is downloaded so that decision boxes can be changed into text.